Please close the servers and stop this farce already. Dino.... please stop this nonsense... the keeps of hope have been defeated long ago. I guess normally we should have new sleeves from next week? Or am I wrong? Employees can quit. They can do it if they disagree with the company's policies. They are not slaves. Just saying. Staying for so long equals him agreeing with the whole jig. This is pretty ridiculous at this point. There are zero new informations being conveyed in these updates. Not even the patch notes from the “maintenance” server patch this week. Why not talk about the changes additions that are being made (such as the impact the player limit has had on Non-firing clash/bash events)?!?!? I know Dinobot is an ongoing joke, but i seriously wouldnt be surprised if hex is just using his account to post stuff and he already left long ago. I would be completely pissed if they did that to me and make it known to people what was going on. Don’t have to wait too much longer to know if insolvency was a correct guess. December 31st is nearing. I’m pretty sure Dino is still actively posting the updates. There is a gag order on actually communicating with anyone left here in the “community”. But there would be no sense in dragging a name in the mud to make disengaged posts once per week. Maybe he loves the game too much and still hopes for a last minute goal. Huh. I was actually expecting something different with shards the deckbuilder releasing on iOS. Predictable really, it was an act of purist optimism to expect anything differing in the first place. Tell me, shopkeep have you got any cheese here at all? 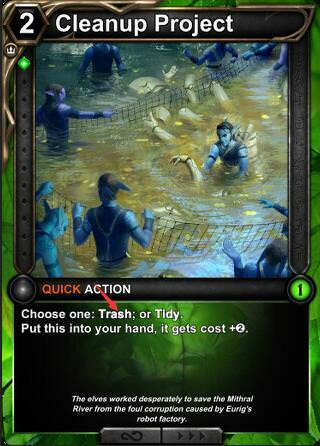 Oh yeah, I don't care I am pulling card image from another game. No card here titled Recycle(d).